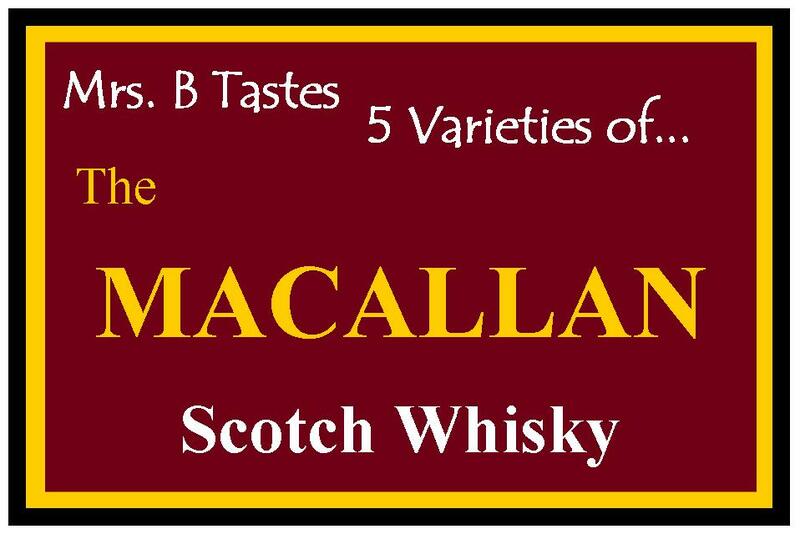 Macallan Scotch Tasting (5 varieties) – Just like James Bond! When DTS & I went to see the latest Bond film, Skyfall, I was pleased to see a strong whisky presence, in particular from The Macallan (this was especially nice, given some of the scenery). Most visibly, it was seen alongside and on the drinks’ tray or desk of Dame Judi Dench’s M – praise, indeed. 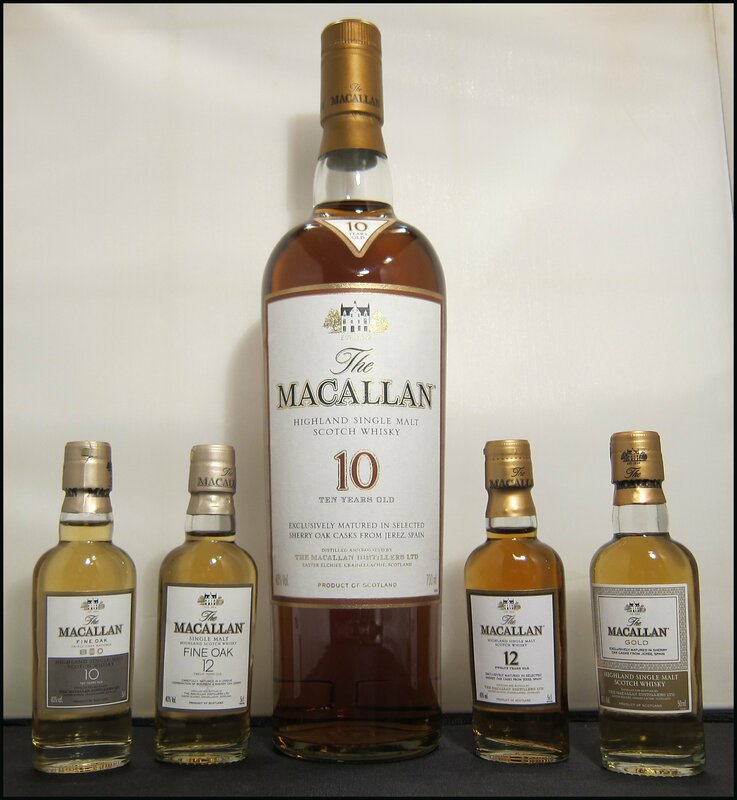 In the box were the 10 and 12 Year Olds for both the Fine Oak and Sherry Oak varieties, plus something new and a little different: Macallan Gold, which is one of the distillery’s new range of whiskies classified by colour rather than age. Although this selection of miniatures would make for a perfect compare-and-contrast tasting, I knew immediately that I wanted to have one of our blind tastings so that I could more easily establish which I liked best. DTS very kindly helped with this and here’s what I thought. First of all, we have a whisky that makes a very sneaky appearance in Skyfall, when Bond is at a beach bar. It has been matured in a mixture of fine bourbon and sherry oak casks. Nose: Light, but sweet; a smooth transition from vanilla cream, to creamy coffee, subtle marzipan, before finishing with a light, vanilla woodiness and faint, fruity sherry and fruit cake. Light, but delicious, with lots to delve into and explore and no harshness whatsoever. Taste: Smooth, but with a warmth building at the back of the throat from the outset. Exceptionally balanced, it nonetheless has lots of delicate notes of leather, barley and fresh, dry, white wood and a clean dry, almost bitter, finish. Next, we have the slightly older Fine Oak 12 Year Old. Unlike it’s slightly younger “sibling”, it has been “triple cask matured”, using a mix of European and American oak casks seasoned with sherry and American oak casks seasoned with bourbon. Nose: Notes of marzipan, light coconut and freshly shaved pencils are accompanied by hints of creamy, tropical citrus (pineapple and lemon) that remind me somewhat of jelly and ice-cream. Taste: This is thick and silky, almost chewy; it also seems a lot sweeter than the 10 Year Old. The flavour starts out woody, with hints of wood ash and smoke, before moving to a creamy sweetness with measured notes of vanilla, reminding me of a very good quality bourbon. The finish has lots of dryer wood notes, but nowhere near the bitterness of the previous whisky. 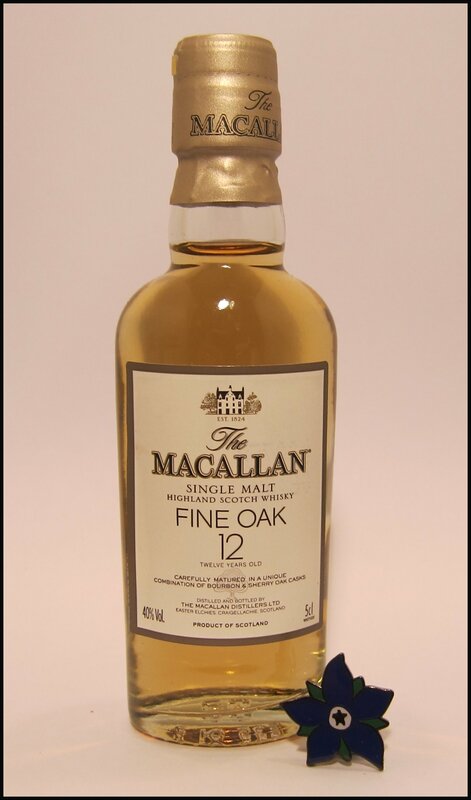 Macallan Fine Oak 12 Year Old has now been discontinued, with the 10 Year Old due to follow imminently, to be replaced with a new range of whiskies that move away from age statements. Macallan Gold was released in 2012 as a part of this range of new, colour-themed bottlings. It has been matured in both first fill and refill sherry casks and is said to sit between the Fine Oak 10 Year Old and Sherry Oak 10 Year Old. Nose: Rich, slightly bitter fruit cake that’s been soaked in brandy. Also, sweet, creamy notes, like a custard that was heavy on both the sugar and the milk, or custard flavoured boiled sweets. Taste: Rich and sweet to start, with a dash of marigold, floral soapiness at the beginning, followed by sweet wood and a more dry, but still distinctly woody, finish with hints of coconut. This seemed generally less warm, but more flavourful, than the previous two whiskies. 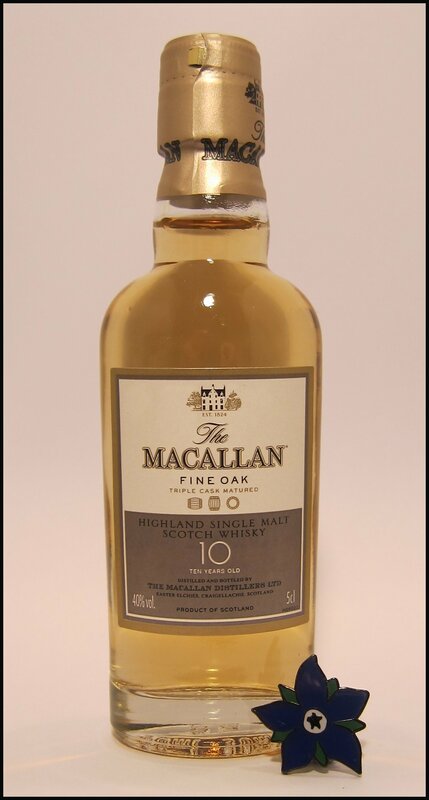 Returning to Macallan’s age-statemented whiskies, we turn to another 10 Year Old; this one having been matured in oak casks that have been filled with sherry in Spain. Nose: Sweet wood, accompanied by caramel and light notes of banana. These are followed by more traditional, dryer sherry notes. Taste: Dry, but warming, with the sherry coming through more towards the end. The finish is decidedly dry. Although this is pleasant enough to drink and contains very genuine, solid notes of oak and sherry, there wasn’t anything about it that really “stood out” to me. Finally, we have another whisky that appears in Skyfall; this time a 12 Year Old matured in Spanish sherry oak casks that sits centre-stage on M’s desk. Fortunately, my tasting was blind, otherwise I might have had raised expectations! Nose: Fresh and fruity, with lots of peach and apricot. Sweet and soft, there’s also some sultana (it’s similar, but not quite as heavy as, raisin). Taste: Silky, but both more flavourful and warmer than the 10 Year Old and the Gold, this is full of dark, sweet wood, spiced raisins, and slightly tarter notes of sherry. There was also a lot of rich, genuine, warm wood on the finish, plus a little of the dryness of liquorice root. All in all, this has everything that I hope to get from a good Scotch – lovely! I love that so many of The Macallan whiskies are available as miniatures (and at very reasonable rates of postage on their website), making them perfect for a tasting such as this. My favourite was, without a doubt, the 12 Year Old Sherry Oak – I can see why M keeps a bottle on her desk! Macallan Gold is available online for around £36 for 70cl from The Whisky Exchange and Master of Malt.